This entry was posted in Training & education on 2017/08/09 by Susan. We’re having a heat wave in B.C. This raises safety concerns for people working outside. Please review these tips for keeping workers safe. It’s a hot one this summer in B.C. Not only are we dealing with wildfires, but we’re also facing record-breaking temperatures. Last year in B.C., there were 16 claims for work-related injuries caused by heat exhaustion and heat stroke, according to a CBC news story. The occupations with the highest number of claims included: truck and bus drivers, lifeguards, recreation sport and fitness leaders, and motion-picture production assistants. Working in the heat can cause heat stress, which means your body is heating up faster than it can cool itself down. This leads to serious health complications and, in extreme cases, even death. 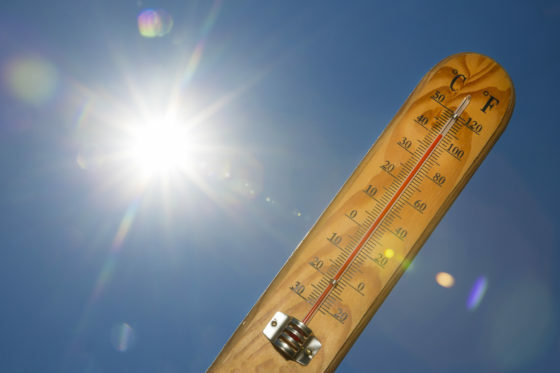 Some warning signs of heat stress include excessive sweating, dizziness, and nausea. Here in B.C., employers are required to “provide adequate training and education to all workers at risk for heat stress, their immediate co-workers, and their supervisors,” reads Preventing Heat Stress at Work, from WorkSafeBC (available in English, Chinese, Korean, Punjabi, Spanish, and Vietnamese). Have workers complete the job in a cooler environment, if possible. Schedule the hardest physical tasks for the coolest part of the day. Rotate work activities or use additional workers to reduce heat exposure. Ensure workers stay hydrated by drinking water before, during, and after work (remind them not to wait until they feel thirsty to drink water). Please remember to stay safe during this heat spell – and enjoy the summer as much as you can.